The Amish Yellow Pine 75" Marlboro Twin Mattress Swing Bed is the ulitmate combination of comfort and fun outside. Make your porch or patio stand out with the Marlboro featured in the custom colors you're wishing for. 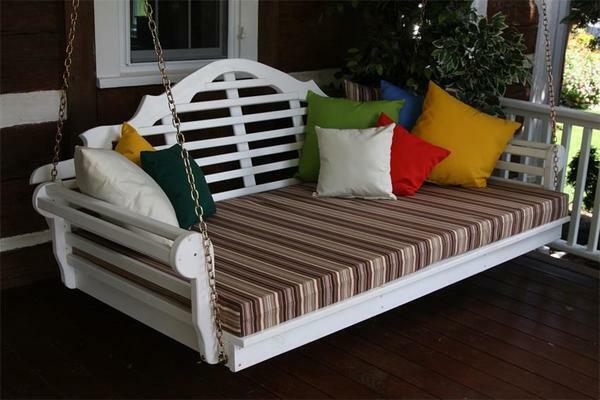 This swing bed is sure to become a hot spot outside with ample room for napping, cuddling, or gathering with family. Enjoy a swinging seat as you share ice cream or iced-tea. The kids will love this pine outdoor furniture to play on and share with siblings and friends. Enjoy this spacious swing bed as your favorite spot outside to socialize or the ideal place to get away from it all. The Marlboro is outdoor wooden furniture like no other. Amish made in Pennsylvania, it's handcrafted by artisans devoted to creating functional and fashionable fine furniture. This deluxe outdoor swing offers a 75" seat width. Wide arm rests are cozy and accommodating. Hardware is zinc plated for rust resistance. This pine outdoor furniture is available stained or painted. We are happy to provide samples for your consideration. Yellow Pine Wood Furniture is handcrafted from untreated Southern Yellow Pine that is knot-free for long lasting durability.